Thanks for joining us on our 2015 trip. We are two retired (2012) Federal Employees on our first East Coast trip. We have made three journeys to the West Coast. Wish us luck on our latest adventure! We purchased our 2012 Tiffin Phaeton unexpectedly at a Fall 2011 RV show – in anticipation of our 2012 retirement. Those darn RV shows will get you every time! They must pump something into the air…. We love our RV, a Tiffin Phaeton called “Jack” – due to the one headlight we lost in California on our first cross-country trip. 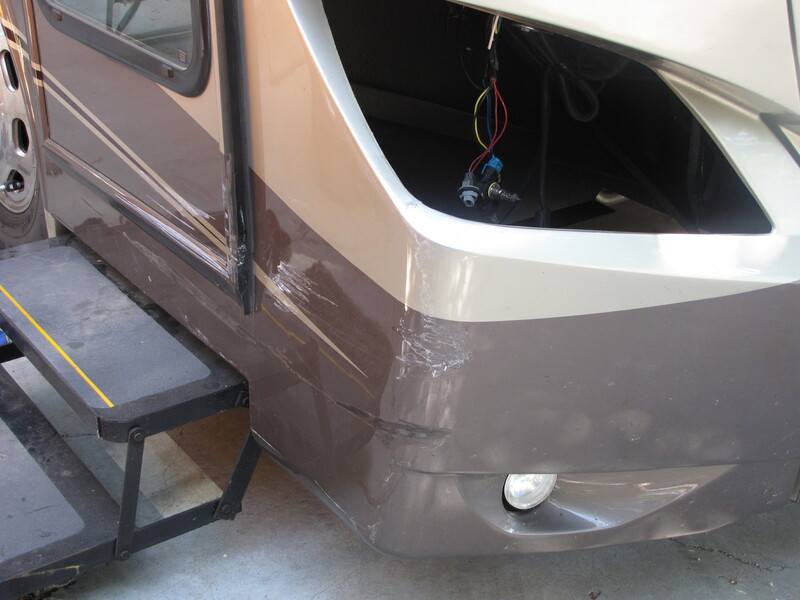 Well, actually, we did not loose it – it was knocked out by a Honda Civic who liked our lane more than his… We have had some issues with the coach and Tiffin has been great about covering the repairs – and knock wood and pray – that we are over the break-in hump. Sigh. I hate to put that in writing. Donald & I retired out of the Northern Virginia area in 2012. We enjoyed living in the DC area – the museums, culture, restaurants – taxes and traffic! We do miss the area and the friends we left behind there. We are happy when they can join us on the road! Prior to living in the DMV we were in New Jersey. We volunteered as Camp Hosts in both 2012 & 2013 & 2014 – We enjoy hosting for a variety of reasons that you can discover at a related post. Most of all we like the snappy vests that Oregon Parks & Rec issues to their volunteers. Hope to see you at the parks or on the road! Thanks for joining us over at ohtheplacestheygo!! I am looking forward to following your adventures. Yellowstone is my all time favorite park with all it has to offer. Very cool,, I , for one would be happy to follow your adventures,, Have you considered a Facebook page ? Bill and Cap (Cathy) workcamp in Yellowstone every summer. She manages the volunteers for the campgrounds. It might be a good blog for you if you are thinking of workcamping there one day. thanks John & Pam for the info – good suggestion! it looks like you have meet many RVers and made many friends. We love that (and many other things) about the RV lifestyle. I will definitely check our their blog for info. thank-you! I sure hope you will still be park hosts when we get our butts back to the West. Oregon is one beautiful state we won’t mind visiting again. Thanks for checking us out. Just to add to the comment above, we met John and Pam of Places they Go and a lot more when we wintered in Florida. Great people. Are you planning a trip out West? We winter in FL but love it out here -this is our third trip visiting and hosting! Enjoy this type of ‘work’! Well of course the name caught our eye! Have you considered Harvest Hosts? Overnighting at wineries & farms might be just up your alley! thanks for your note Kim & Don – we will look to join once we venture back East. Our friends the Nealys (NealysonWheels) rave about your properties and highly recommend your service! We hope to see you soon! We look forward to following your adventures! We love the OR coast and hope to do some camp hosting there as well. I love the title of your blog and look forward to following you along on your journey. Thanks for following my blog.